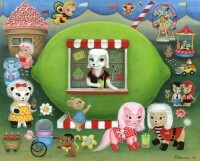 Lisa Petrucci is a household name among those who love colorful pop surrealist paintings. 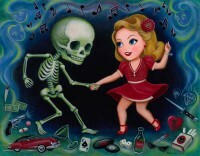 Her work has been dubbed as a mixture of vintage pinup pop with a touch of kitsch. 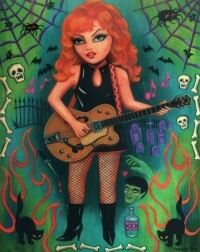 It’s this overplayed subject transformed and presented with different packaging that makes her work utterly adorable. 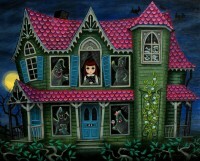 The petite painter (she’s only 5’0) is an avid collector of vintage dolls as well as toys. 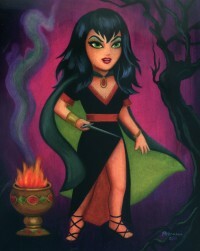 She also has a soft spot for movie memorabilia, tiki’s and men’s magazines among other things. She also admits to watching a lot of television and simply adoring her cats. 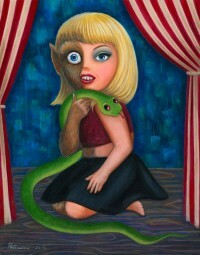 You can check out her works over at her site but if you prefer having it in front of you, she’s currently holding a solo exhibit showcasing her “Kickass Kuties” over at La Luz de Jesus Gallery. The show runs until the 27th of this month so you might want to hop on over there if you’re in the area. Posted by Valerie on January 9, 2013. Filed under Decor, Headline, Images. You can follow any responses to this entry through the RSS 2.0. Both comments and pings are currently closed.